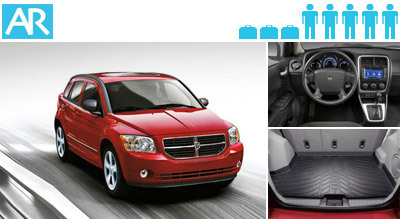 The Dodge Caliber is considered a Compact rental. Although, there is ample room for 5 people and lots of space in the gracious trunk (great for luggage). The front passenger dash actually has a cold beverage storage area. Every one of our vehicles, including this compact car, have air-conditioning. Check rental rates now and lock-in our discounted prices.